Braap (or Braaaaap!) is the sound that comes from a combustion engine when opening up the throttle. It gives a strong feeling of being alive. We started with BRAAP.® because we wanted to create small series of unique, high-quality, yet affordable items especially for petrolheads. We L-O-V-E smooth cars, motorcycles (vintage & custom! ), and like to ride an MX from time to time. You get it: as long as it has wheels and an engine, we like it! We’re always looking for cool items to distinguish ourselves. 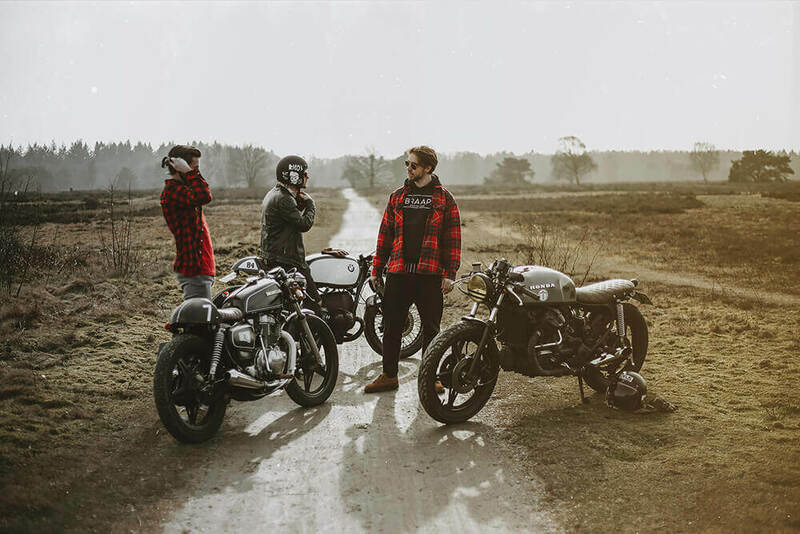 It all started when one of us was looking for a typical “cafe racer scarf” with a finish flag checkered pattern for his custom-built motorcycle. After some extensive online searches, he soon realized that these were pretty hard to find and that most of the items online felt and looked cheap. So he created one by himself. When he was out for a ride with his chess checkered scarf, he got a lot of thumbs up and compliments about it, so he decided to produce this scarf in a small series. For this, we teamed up with a local fabric specialist and manufacturer which helps us create the best quality scarfs. And that’s pretty much the story of BRAAP.®. We don’t want to offer a complete catalog with riding gear, we just want to create small, unique items that act as a finishing touch or have a clear statement. We have a varying range of shirts, caps, scarfs, neck tubes, key tags and even socks. We create all the designs and artworks ourselves and we get our inspiration from the “old days” when the cafe racer and rocker culture emerged. Next to that, we like to work on small series of “limited editions” together with friended brands. Production takes place at small, local manufacturers, keeping the spirit of craftsmanship alive in our products. We didn’t just pick the first free domain name to name our brand. It’s is a way of living; it’s what you hear when opening up the throttle. It’s just: BRAAAAAP!! and nothing else. We thought that this was the perfect description of our brand. If you want to know more about us, get in touch!